As more business is conducted via email, some workers have lost their business phone skills. However, the business phone is still a viable and important medium for connecting with others at work. 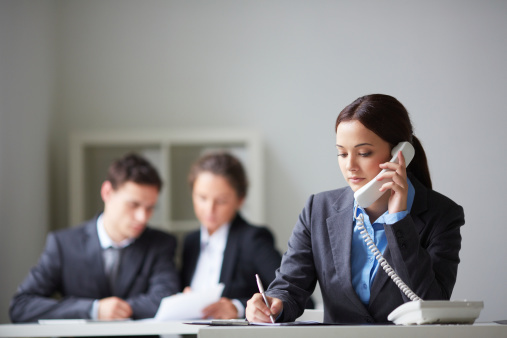 Follow these tips to make sure your business phone etiquette is up to par. Your tone of voice can make or break a business phone conversation. Whether you’re speaking to a customer or to a co-worker, maintain a professional, pleasant and authentic tone at all times. Even if a less-than-pleasant conversation is testing your patience, maintain a positive tone to avoid having the talk spiral into a negative and unprofessional place. Through each phone conversation, periodically do a quick mental check on your tone of voice and adjust it as needed. Body language may seem unimportant when talking on the phone, but it can actually have a major impact. When you begin a phone conversation, sit up, smile and remain attentive to what the other person is saying. Avoid distractions such as browsing apps on your phone or tidying up your desk while having a business phone conversation. The other person on the line will quickly sense if you’re distracted and will lose interest in the messages you’re trying to convey. Each call you make at work should remain in the professional realm. If the person on the other end of the line attempts to take the call into unprofessional territories, avoid the bait and get things back on track. If a customer calls to complain about your products or services, let them rant, but never let them feel as if you’re agitated by their words. Rather, thank them for their feedback and do what you can to earn back their trust in your company. Need to make a business phone call that will cover sensitive business information? You can always count on others in your work area to actively or passively tune in on your phone conversations. So, take phone calls to a private area of the office when needed. Last, when making phone calls in communal work areas, avoid talking too loud on the phone. Few things are more annoying while trying to work then a coworker talking loudly on the phone. According to “Telephone Sales Skills – Focus on the Basics of Telephone Etiquette,” you should quickly state your purpose when making a business call. Don’t start a phone call with a potential customer by asking them about the weather in their location. Rather, clearly tell them who you are, why you’re calling and, most importantly, why the phone call is beneficial for them. Also, stay on topic through the call and avoid wasting the other person’s time on unnecessary and irrelevant topics. Despite the convenience of email, the business phone is still an important medium for connecting with coworkers, customers and others. Hone your business phone etiquette by learning the importance of factors like your tone of voice, body language and more.